It was around the lengthy shot of Shirley Henderson running across the waste of Oregon's Empty Quarter that I had an inkling I was watching a good film. A pack of emigrants in the awkward stage of the American westward migration follow wilderness trekker Stephen Meek (Bruce Greenwood) on his uncharted hunch towards points unknown. As this film is a bastardized true story, you can assume the settlers’ decision made for a historically unwise shortcut. 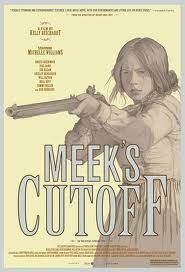 A survivalist Western or a cautionary tale from the female perspective, Meek's Cutoff depicts the struggles of human endeavour from the micro-level of three covered wagons at the buffoonish mercy of Meek, all tan buffalo hides and cowboy-shirted bluster, onwards to green grasses that might just be over another hill, thataway. Michelle Williams is Emily, one of the wagoners' wives, cannier than Henderson's brittle missionary, braver than young Zoe Kazan of the fickle gold-seeking couple. Emily and her husband Solomon (Will Patton) stand across the divide of gumption from Greenwood's Meek, and as the wheels croak along dry beds, the campfire whispers grow louder as the water becomes scarcer. Beyond the dehydration, mountain fever, and Meek's unreliable drunkard shtick that could kill all of them, the tension is further ratcheted up for the travellers with the capture of a lone Indian (Rod Rodneaux), who could be hostile but will also suffice as their saviour if they correctly understand his foreign gestures for water. Meek's becomes a parable for our age at the fault lines of race and global cohabitation, with the dilemma of the Indian's presence depicted honestly. He thankfully doesn't speak in honourable platitudes, with his strange nature and pagan tongue matching the unease of the dire surroundings. So the wagons stumble down deeper into the valley. It's rare to view an overlooked perspective on an old-hat film genre such as the lonesome Western, but Meek's succeeds in depicting the quiet dread of the women folk going about their chores while the men folk, out of earshot, discuss the facts of their survival and whether anyone needed to be lynched or throttled that day. Emily and the wives are off-stage extras eavesdropping on a sloppy performance concerning the slim chances of their existence. The mere act of loading gunpowder into a rifle becomes as leaden with portent as the hypothermia killing Jack London's protagonist's in To Build a Fire. The cast is mostly sterling aside from my indifference for Paul Dano's mannered work, with Greenwood as enjoyably broad as his beard is manky, seeming to arrive straight from the same off-beat travelling Wild West act as Jeff Bridges recent take on Rooster Cogburn. Michelle Williams, in her second lead role for a Reichardt film, plays a fairly modern protagonist (and a mildly unbelievable one based on the time period) with aplomb and admirable cunning when needed. As the director of the praised indies Old Joy and Wendy and Lucy, Kelly Reichardt climbs above the modest ambition of her past work into the forefront of American filmmakers making essential stories, as the ending of Meek's Cutoff itself arrived with the surety of buckshot over the plains. So far, it's the best film of 2011 I've seen. Hell, just go to Chicago regardless, I love that town. Oh, and Reichardt should be winning an Oscar or Palme d'Or one of these days. I used to live there and family still does. Drop off the kids at the grandparents and head to the theatre. I like this plan.